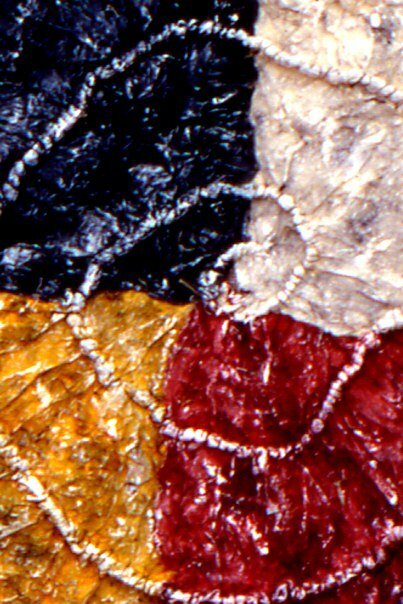 Hand-stitched, painted, and dyed banana bark papers and canvas. Cotton and hemp threads. 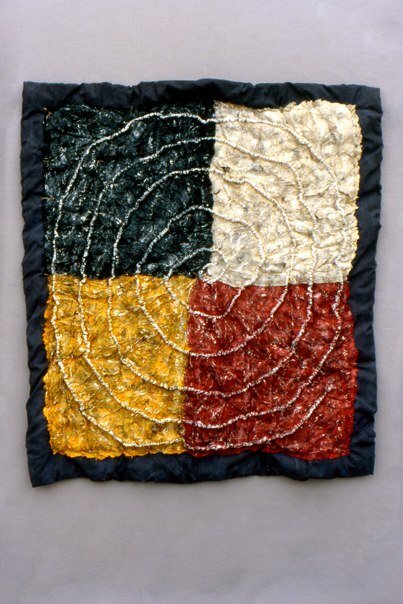 This was an early fiber experiment with stitching and color. I tortured some large sheets of paper made of banana tree bark and cotton, then stitched them together. I then sewed this sheet onto a cotton batting, raising the spiral by gathering up the cotton and paper and stitching the materials tightly. This was then stitched on to a quilted background of painted canvas. There is a journal entry hidden in/ on this piece, entitled "The Illusion of Dream." The words were painted onto the papers after they were stitched together, but before the spirals were added. I often hide (or purposefully reveal) words and text in my fiber pieces, as stories have been a strong influence in my life. Hand-stitched, dyed and painted paper. This was the Maquette, or test piece, I did before starting on the larger project.